Captain Lawrence’s pig roast was a yearly highlight at its previous Pleasantville locale, people schlepping from all over the county—and beyond—to partake in fresh roasted pork and, of course, locally brewed craft beer. The event was skipped last year, Captain Lawrence’s first few months in its new Elmsford home, but is on for June 22. There will be a dozen beers on tap, including the Freshchester Pale Ale and the Kolsch, live music from Rebecca Haviland and Captain Lawrence Brewing alum Evan Watson, and lots and lots of roasted pigs for your porcine pleasure. One constant of the pig roast over the years is the source of the pigs: Hemlock Hill Farm up in Cortlandt. 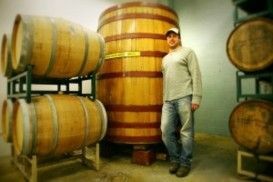 Scott’s relationship with farm owner John DeMaria goes back to the first batch of beer brewed in Captain Lawrence history. Scott had a giant bunch of spent grain that he didn’t know what to do with, and after leafing through the Yellow Pages, found a local farmer who was happy to take it off his hands. A business relationship, and friendship, ensued. Tough times have struck the farm—which lost a 200-year-old barn and thousands of chickens—in a fire in late April. Captain Lawrence is doing its part, and then some, to help an old friend. A week’s worth of “Barn Raiser” events, including Trivia Night, a June 17 brewery dinner prepared by Armonk’s Restaurant North, and finally the pig roast, will raise funds to help one of Westchester’s remaining farms. Speaking of big and rich beers, with Father’s Day coming up, it must be time for another St. Vincent’s release. Each Father’s Day, Captain Lawrence puts out the St. Vincent’s—an ode to Scott’s own dad, Vincent Vaccaro, with Dad’s beloved bright red 1969 convertible Datsun 2000 on the label. Every previous one has been a Belgian-style dubbel, but 2013 is a quadruple. At a lively 11 ABV, the draft-only quadruple will be a mouthful. “It’s real rich, real strong, and real intense,” says Scott.